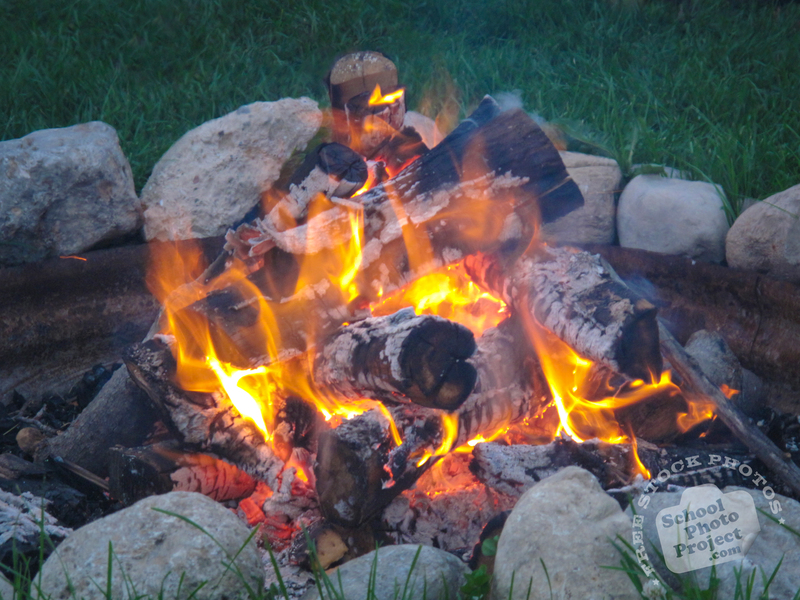 A campfire is a fire lit at a campsite, to serve the following functions: light, warmth, a beacon, an insect and/or apex predator deterrent, to cook, and for a psychological sense of security. In established campgrounds they are usually in a fire ring for safety. Campfires are a popular feature of camping, particularly among organized campers such as Scouts or Guides. In some regions it is called a bonfire, especially when it is of a very large size. Ideally, campfires should be made in a fire ring. If a fire ring is not available, a temporary fire site may be constructed. Bare rock or unvegetated ground is ideal for a fire site. Alternatively, turf may be cut away to form a bare area and carefully replaced after the fire has cooled to minimize damage. Another way is to cover the ground with sand, or other soil mostly free of flammable organic material, to a depth of a few inches. A ring of rocks is sometimes construted around a fire. Fire rings, however, do not fully protect material on the ground from catching fire. Flying embers are still a threat, and the fire ring may become hot enough to ignite material in contact with it.